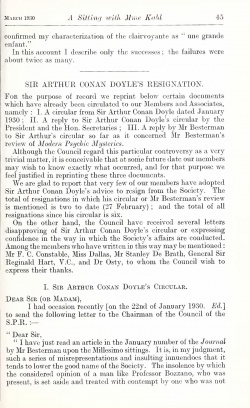 Sir Arthur Conan Doyle's Resignation is an article published in the Journal of the Society for Psychical Research in march 1930, containing a letter written by Arthur Conan Doyle announcing his resignation from the society. "I have just read an article in the January number of the Journal by Mr Besterman upon the Millesimo sittings. It is, in my judgment, such a series of misrepresentations and insulting innuendoes that it tends to lower the good name of the Society. 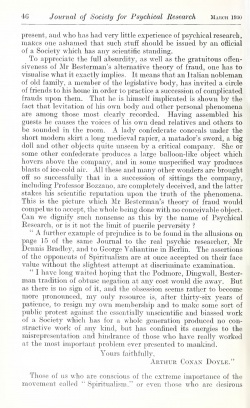 The insolence by which the considered opinion of a man like Professor Bozzano, who was present, is set aside and treated with contempt by one who was not present, and who has had very little experience of psychical research, makes one ashamed that such stuff should be issued by an official of a Society which has any scientific standing. To appreciate the full absurdity, as well as the gratuitous offensiveness of Mr Besterman's alternative theory of fraud, one has to visualise what it exactly implies. It means that an Italian nobleman of old family, a member of the legislative body, has invited a circle of friends to his home in order to practice a succession of complicated frauds upon them. That lie is himself implicated is shown by the fact that levitation of his own body and other personal phenomena are among those most clearly recorded. Having assembled his guests he causes the voices of his own dead relatives and others to be sounded in the room. A lady confederate conceals under the short modern skirt a long medieval rapier, a matador's sword, a big doll and other objects quite unseen by a critical company. She or some other confederate produces a large balloon-like object which hovers above the company, and in some unspecified way produces blasts of ice-cold air. All these and many other wonders are brought off so successfully that in a succession of sittings the company, including Professor Bozzano, are completely deceived, and the latter stakes his scientific reputation upon the truth of the phenomena. This is the picture which Mr Besterman's theory of fraud would compel us to accept, the whole being done with no conceivable object. Can we dignify such nonsense as this by the name of Psychical Research, or is it not the limit of puerile perversity ? "A further example of prejudice is to be found in the allusions on page 15 of the same Journal to the real psychic researcher, Mr Dennis Bradley, and to George Valiantine in Berlin. The assertions of the opponents of Spiritualism are at once accepted on their face value without the slightest attempt at discriminate examination. "I have long waited hoping that the Podmore, Dingwall, Beater-man tradition of obtuse negation at any cost would die away. But as there is no sign of it, and the obsession seems rather to become more pronounced, my only resource is, after thirty-six years of patience, to resign my own membership and to make some sort of public protest against the essentially unscientific and biassed work of a Society which has for a whole generation produced no constructive work of any kind, but has confined its energies to the misrepresentation and hindrance of those who have really worked at the most important problem ever presented to mankind. This page was last edited on 20 June 2016, at 10:20.